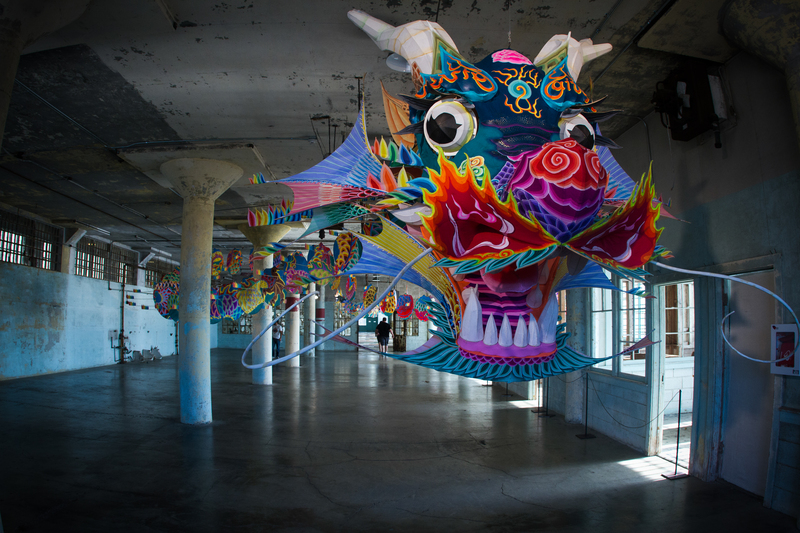 In addition to the opportunity to book tickets up to 90 days in advance of the desired tour date, visitors to Alcatraz will enjoy the added benefit of complimentary access to the iconic exhibit @Large: Ai Weiwei on Alcatraz with the purchase of a regularly priced ticket through the exhibits’ duration of April 26, 2015. The @Large: Ai Weiwei exhibit responds to the island of Alcatraz and its layered history as a place of detainment and protest. The exhibition features new sculpture, sound and multimedia works exploring pressing themes that have characterized Ai Weiwei’s art and activism—the right to free expression, the irrepressible nature of creativity, and the role of art, artists and individuals worldwide in shaping social change. The installations address these concepts in ways that are both personal to the artist’s experiences and life in China and resonant with individuals and communities internationally. Responding to the potent history of Alcatraz Island, the exhibition examines incarceration as a tool of repressive governments, and creative expression as an act of defiance and individual freedom. Artworks are installed in four sites throughout Alcatraz Island. One of the most prominent artists of the 21st century, Ai Weiwei is an architect, sculptor, photographer, filmmaker, curator, writer and activist whose work often responds to conditions in China, including the government’s repression of free speech and expression. Few islands in the world can boast such a glorious natural setting – and grim human past – as Alcatraz. Visited by Native Americans as early as 10,000 years ago, the barren island remained uninhabited until Europeans arrived. Spanish and Mexican settlers in the early 1800’s called the guano covered island “Isla de los Alcatraces” – Island of Pelicans. Alcatraz began its long era as a dreaded place of confinement when soldier-convicts were first imprisoned at the fort in 1860. Over the next decades, the island became less of a defense fort and more of a military prison, with Army convicts building most of the structures still standing on Alcatraz today. Alcatraz was reborn as a civilian Federal Penitentiary in 1934, becoming known in the press as “The Rock” and “America’s Devil’s Island.” Wardens at Atlanta, Leavenworth and other federal prisons selected their most unruly convicts to transfer there, among them Al Capone and “Machine Gun” Kelley. No less tough and carefully selected were the guards, one for every three prisoners, who were trained to use their wits as well as their muscle when trouble broke out. Over the years, escapees fashioned crude water wings and wooden flippers and attempted the swim, but either drowned or were caught while swimming. In 1962, convict John Paul Scott became the first and only penitentiary escapee to reach the San Francisco shore. He was discovered unconscious on the rocks of Fort Point, purple and shivering with just his socks on. Too weak to continue, he ended up back where he started. In that same year, Attorney General Robert F. Kennedy announced the phase-out of the prison. Alcatraz was turned over to the General Services administration as surplus property and most of the inmates were transferred to a new facility in Marion, Ill. Over the next few years, hundreds of proposals were submitted for new uses for the island, including a West Coast version of the Statue of Liberty, a casino resort and space museum. In 1969, a group of 300 Native Americans began a 19-month occupation of Alcatraz, claiming rights to the island under an old Sioux Treaty that gives Native Americans the right to unused federal lands. While the occupation put a media spotlight on Native American issues, the numbers of activists gradually dwindled and Federal marshals removed the last few from the island in June 1971. Each November Native Americans of many tribes return to Alcatraz to hold a sunrise ceremony commemorating the Occupation. In 1972, Alcatraz became part of the newly designated Golden Gate Recreation Area, a unit of the National Park Service. Tours of Alcatraz began the next year, now drawing some 1.5 million visitors a year to a place so many men had once dreamed of never seeing again. Alcatraz Cruises is the National Park Service concessioner of ferry service to Alcatraz Island in San Francisco Bay. Alcatraz Cruises hosts nearly 1.5 million visitors annually. Alcatraz Cruises designed, built and operates the first hybrid ferry in the United States. The Hornblower Hybrid’s revolutionary design has reduced fuel consumption by 75% and has already begun to be implemented in other parts of the country. For more information visit: http://www.alcatrazcruises.com/pressroom.